DETROIT RUNNER....: 2013 schedule....I'm a planner! 5 miles on the schedule today.....done. 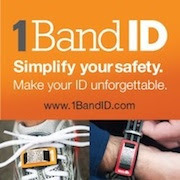 Please vote for me today(contest ends this morning) and maybe win a free pair of shoes. I need your help. I'm trying to win $1500 in travel and want you to win some shoes! The contest is put on by Merrell Shoes and Onlineshoes.com Please share with your friends. Thanks. I appreciate the support. Go HERE to vote! As the season comes to an end(really, it's the end already?). Ok, not really the end, just kind of getting going for fall. I have started to already determine what races I want to run the following year. Now many of the races that I've done over the past year, I did not even have on the schedule. I won them from organizations such as Renewal by Andersen of Detroit and Refuel with Chocolate Milk and truly appreciate those organizations sponsoring runners and the running community. Also, I've been a race ambassador for Kona Running Company over the past year but have run in their races for several years. Some races I have to plan far in advance just to get into the race or to get in at a great price. For example, in order to even get into Bayshore, you need to sign up when they start registration(December 1 for a end of May race) because they sell out so fast. Or for next Spring, I've already signed up for the Lansing Half marathon(signed up in June 2012 for an April 2013 race) in order to get a really good deal on the race. At this point, I've got two races on my schedule already for next year. That's the Rock CF Rivers Half Marathon down in Grosse Ile where I'll be a race ambassador for them this year. They will start registration at the Freep Marathong but more details to follow on this race. If you have not run Grosse Ile before, you don't want to miss it. Since it's in March, you are assured pretty decent running weather unless, of course, we have a winter storm, and frankly, I would not mind still running in it. In fact, I think it would be kind of fun(except ice). Of course, I'm not sure the volunteers would think it's fun. Ha! The second race as I said is the Lansing Half marathon. This was a new race last year and I heard some good things and some bad things about the race so I decided to sign up and see how it goes. The one will take place in April. I'll be running it with my running buddy, T as well. I know already that I'm going to sign up for the Bayshore half marathon in May. I'm really looking forward to trying just the half. The full was great for a first marathon but I really don't feel like training for another marathon in the spring. 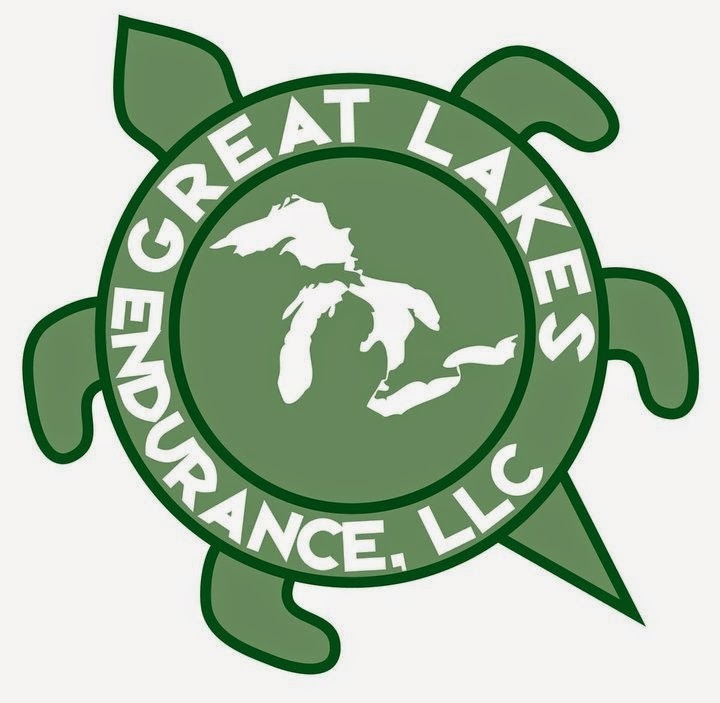 This is a fun race and a great get away in Traverse City. I'm sure I will also be running the Kona Running Company Races as well - The ShamRock N Roll 10k(March), the Kona Run 10 mile(June) and the Wicked Halloween Run 10k(October). I also know that I'll be running the Crim 10 mile(August) next year as well. So it does appear that the race schedule for 2013 is already filling up quickly. The one thing that I think lacks in my schedule is races in January, February, November and December. I would love to run half marathons each of those months but can never seem to find anything unless I drive several hours or go out of State. 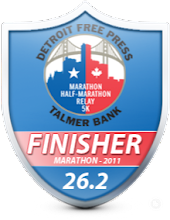 Anyone know of any half marathons in Michigan during that time period? Maybe I'll have to start one! Would you run a half marathon in one of those months? That's some serious planning ahead of time! Traverse is a great area to visit. The indoor would make for lots of laps for sure. I like to plan in advance too and this year there were several races I wanted to travel for but they conflicted with closer ones I'd already registered for. I'm trying to do better planning for 2013! I'm looking at possibly doing Bayshore. I want to keep signing up for marathons because if I don't I know I will let my mileage slip. Never heard of the Gross Isle one. Mark - the Rock CF is a great race that goes around the island. It's one to do for sure. If you do Bayshore, make sure you sign up as soon as available. I heard the half sold out in 3 hours. Marathon I think was same day. I am a planner too. My schedule for 2013 is already starting to fill up!! Awesome! Maybe I have a chance to beat you before you get your speed back? Ha. Your Husband running it as well? Keener! hahaha just kidding I am glad there are people out there that like to plan..I am not one of those! I'm already signed up for two races next year as well... The Shamrock Half Marathon in Virginia Beach, VA on March 17 and the Utah Valley Half Marathon on June 8 in Provo, UT. Also planning to do one in NH in April, WY in June, ME in July and VT in September!! Wow Mallory - you're going to be all over the place - cool! THanks for the reminder that I need to start thinking about races for next year. Building my miles back is still hard, but I'm getting there, and I'm SO excited about getting back into racing form and distance!! Time to plan!